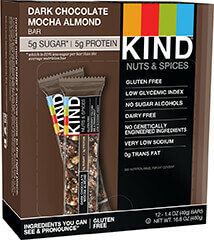 Savor the taste of dark chocolate mocha all day with the KIND Dark Chocolate Mocha Almond bar. This buzz worthy snack is packed with 5g of protein and has only 5g of sugar per bar. Our Nuts Spices bars have to meet a strict standard: 5g of sugar or less. And full of delicious flavor, they seem too good to be true. But made from simple and whole ingredients, they’re a snack that only tastes indulgent.